At the height of the Afghan Surge, more than 100,000 U.S. and coalition troops were committed to a counterinsurgency (COIN) mission of "clear, hold, and build" on behalf of the Government of the Islamic Republic of Afghanistan: Clear the countryside of insurgent fighters. Hold the terrain, alongside Afghan security forces. Build infrastructure, commerce, and rule-of-law. As part of this wave, the 2nd Brigade Combat Team, 34th Infantry "Red Bull" Division (2-34th BCT) deployed more than 3,000 citizen-soldiers to Eastern Afghanistan. It was the largest call-up of Iowa troops since World War II—and one of the only times a U.S. National Guard brigade was designated as a "battlespace owner" during Operation Enduring Freedom. They called themselves "Task Force Red Bulls." Johnston, Iowa-based Middle West Press LLC announces the November 2016 publication of "Reporting for Duty," an historical collection of U.S. Army public affairs articles and images released during the 2-34th's 2010-2011 deployment as Task Force Red Bulls. The fully indexed, 668-page trade paperback features more than 285 easy-to-read articles, and more than 360 black & white newspaper-quality photos. Retail price is $27.99 U.S. The book is available via national on-line book vendors, such as Amazon here. A 60-second promotional book trailer is here, and below this blog post. "Task Force Red Bulls Public Affairs produced an amazing amount of content while in Afghanistan—easily more than 1 million words, and hundreds of images," says book's editor Randy Brown. Brown is a retired member of the Iowa unit and a former Iowa community newspaper editor. In May-June 2011, Brown also embedded with the 2-34th BCT for a few weeks in Afghanistan. "During the deployment, readers of individual news articles probably couldn't appreciate the scope and the scale of the missions at hand. Each story related to the larger "clear, hold, and build" mission of U.S. and coalition forces in Afghanistan." "It's been amazing to pull all of those narratives together, and to re-order them chronologically," Brown says. "With everything collected as a book, the Red Bull's deployment year becomes this epic story—with a beginning, middle, and end." While digital archives such as the Defense Video and Image Distribution System (DVIDS, pronounced "DIH-vids") continue to operate, Brown notes that many deployment-specific websites and social media channels have proven less permanent. "Websites such as 'IowaRedBulls.com' and 'CJTF-101.com' simply no longer exist," he says. "This on-line history needed to be preserved in print." 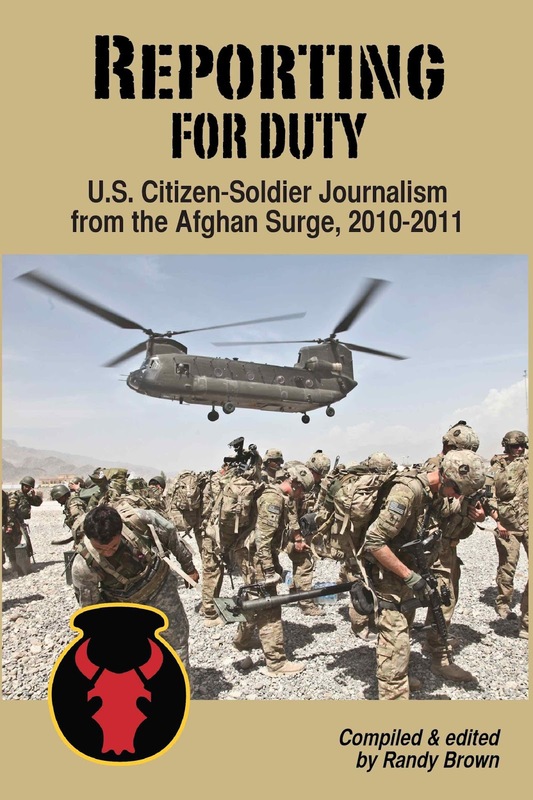 With assistance and new insights from former members of the Task Force Red Bulls Public Affairs, Brown compiled, edited, and indexed 2010-2011 Army news coverage from "Area of Operations Red Bulls," which includes Parwan, Panjshir and Laghman provinces, along with a portion of Nuristan. Also included is similar coverage from Paktya Province—"Area of Operations Lethal"—where Iowa's 1st Battalion, 168th Infantry Regiment (1-168th Inf.) was deployed "Task Force Lethal" under a different brigade's control. Coverage includes a full-spectrum of activities and actions by Red Bull units and their partners, including Provincial Reconstruction Teams (P.R.T. ), Agribusiness Development Teams (A.D.T. ), Embedded Training Teams (E.T.T. ), and more. "I'm particularly pleased that we were able to successfully index the coverage," says Brown. "Readers can look up soldiers by name, to find family and friends in every story or photo in which they're mentioned. This is a great research tool. I particularly hope this book finds its way into community, school, family, and museum libraries." In 2017, the 34th Infantry "Red Bull" Division celebrates its 100th anniversary. "Middle West Press will be looking at additional projects involving Midwestern voices and history. And continuing to tell the Iowa National Guard and 34th Inf. Div. stories will, no doubt, be a large part of that effort," says Brown.